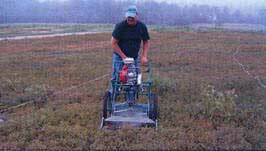 Prepared by David E. Yarborough, Extension Blueberry Specialist, The University of Maine Cooperative Extension, Orono, ME 04469. Revised February 2011. The Emerson harvester is produced by Zane Emerson. It has a rotating head with a conveyor to bring it into a plastic box (holds 10 kg) behind it. J.M. Bouchard et Fils Inc. The Bouchard Rake ( 80 cm head width) has a flat rake head that must be raised to empty into a box behind it (holds 10kg). It is slower to operate than the Emerson harvester. Doug Bragg Enterprises Ltd. 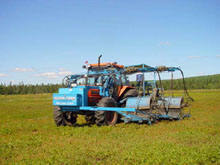 Mechanical Blueberry Harvester consists of a reel-type picking head. 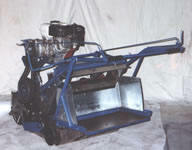 The head is side mounted to a tractor in such a manner as to allow the picking head to follow contours of the ground. The reel rotates within the head in the same direction as the tractor wheels. This rotation is at a speed in ratio to the forward motion of the tractor. 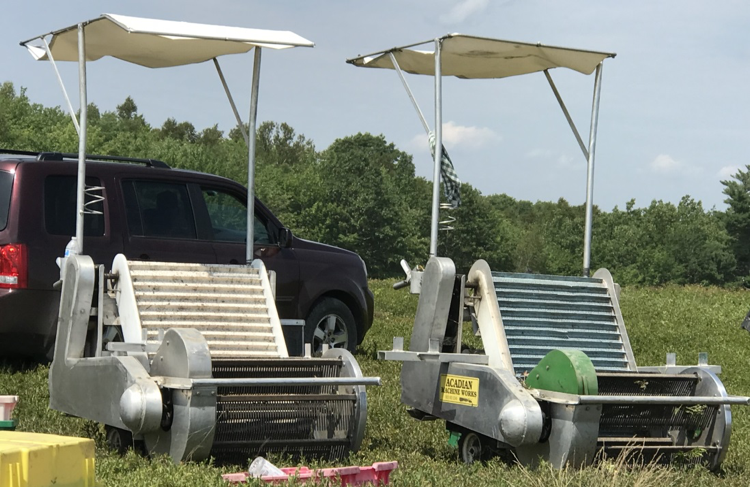 As the comb type-picking bars rake the blueberries from the plants they are carried around the reel and deposited in a conveyor. This conveyor delivers them to another longer conveyor, which carries them to the rear three-point-hitch mounted loading platform. 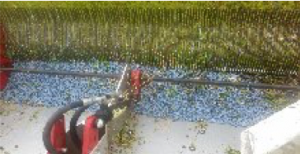 As the berries fall from the conveyor a blower cleans them. All units are equipped with an electric computerized controller. This controller sends its signals to an electric-over-hydraulic manifold and corrects the reel rotation speed according to the tractor speed. 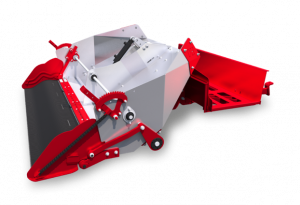 This harvester can be mounted on most models of tractors from 35hp and up. The operation of this harvester requires two people only, one to operate the tractor and the other to handle the boxes of berries on the rear-loading platform. 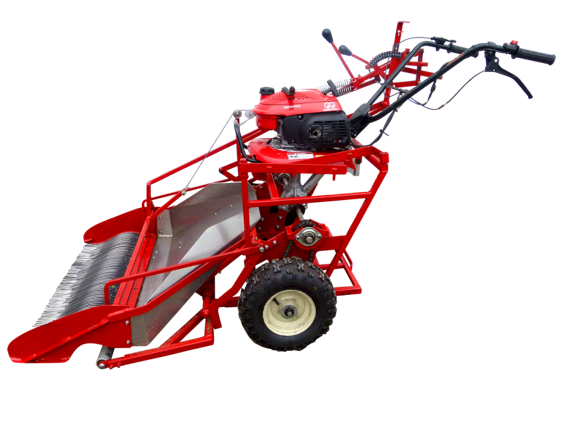 These harvesters are available in single, double and triple head configurations. These machines have been proven to reduce the harvesting costs as much as 50% and are more efficient than hand raking for product recovery. 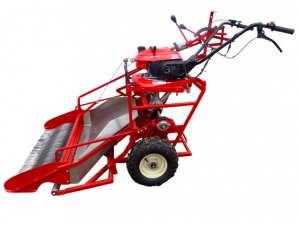 For use on low bush blueberries, agile and easy to operate, self-propelled by either 4 HP or 5-1/2 HP Honda Engine, clean picking. 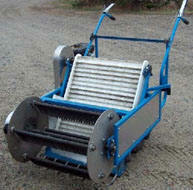 Darlington Blueberry Harvester. 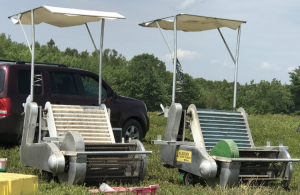 DH Equipment has designed several machine models before arriving at a machine configured and optimized for wild blueberry picking. Walk behind harvester and tractor mounted harvester. No product guarantee or endorsement is implied, nor is discrimination intended against other sources.